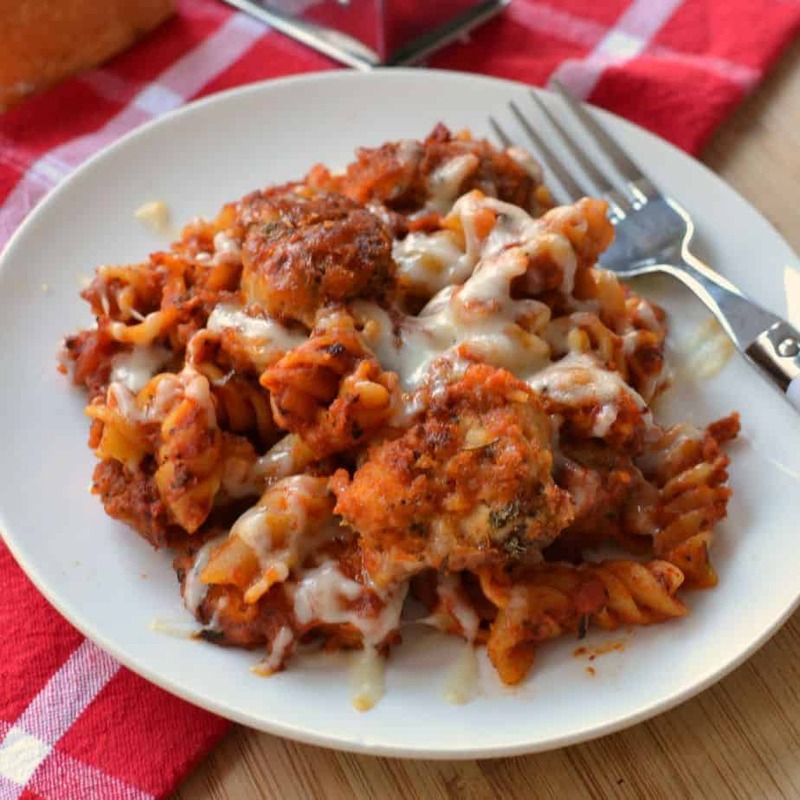 Delectable Chicken Parmesan Casserole combines crispy panko breaded chicken bites, pasta, marinara and a winning three cheese combination. This delicious meal is easy enough for a weeknight yet satisfying enough for Sunday supper. Are you watching your carbs? No problem at all because this scrumptious casserole can be made with or without pasta. It is a little piece of heaven in an otherwise frozen tundra! It calls for a three cheese blend which is the perfect accompaniment to the perfectly breaded chicken. Can you say mouthwatering? I bet dollars to doughnuts that you can! How do you make Chicken Parmesan Casserole? If you are adding pasta cook it according to package instructions and drain well. Then simply dip your chicken pieces in the egg mixture and then in the breadcrumb mixture. Fry the breaded chicken in a little butter and oil mixture. Combine your pasta, chicken and marinara in a casserole dish. 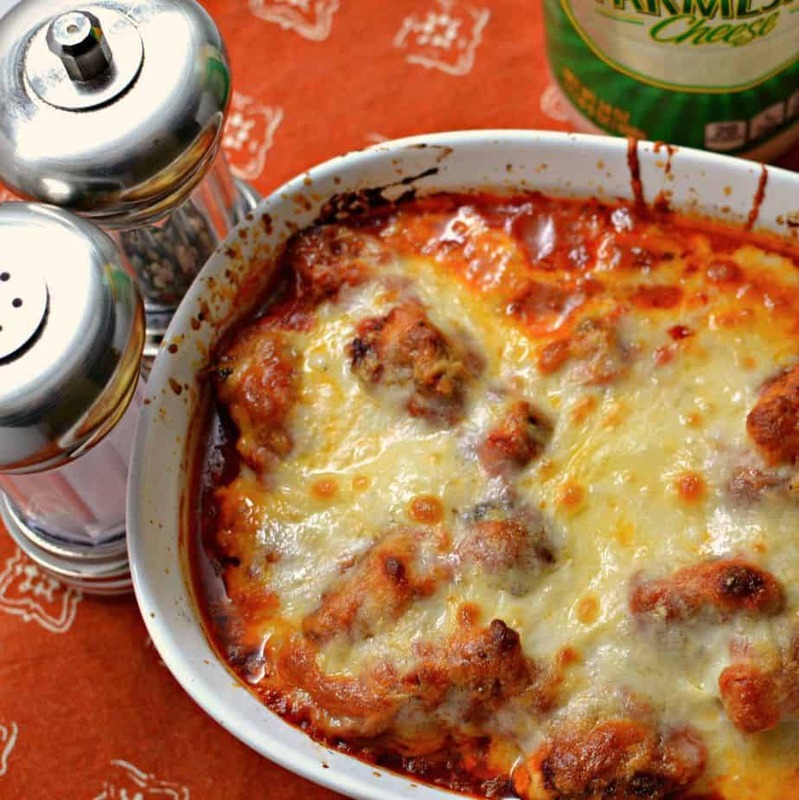 Top your casserole evenly with the Parmesan, Mozzarella and Provel. I will talk more about Provel and possible substitutions a little further down. Bake the casserole until is lightly browned on the top. I grew up on provel cheese. My first experience with it was a local pizza shop name Imos. Imos started out as a local franchise in South St. Louis but has since grown into a national franchise. Their unique pizza signature is using provel cheese or at least they do here in Missouri. This started Missouri’s love of provel cheese and it was not long before Costco and local grocery stores started carrying provel cheese. Provel cheese is a combination of cheddar, Swiss and provolone. Provel has a low melting point making it perfect for casseroles like this. It has a gooey buttery texture. It is not available everywhere but if it is in your neck of the woods pick some up and give it a try. What are good substitutions for provel cheese. If you do not reside in the Midwest you may not have access to provel cheese. The best substitute is provolone. It is difficult to find shredded provolone but most deli counters sell provolone so just purchase a chunk of it and shred it yourself. Freshly shredded cheese always tastes better anyway. If that is not an option for you simply add more mozzarella or a combination of mozzarella and provolone. What kind of pasta is best with Chicken Parmesan Casserole? If you bake the pasta in with the dish please cook it al dente (a little firm to the bite). Almost any pasta works well with this casserole but my favorites are linguine, rigatoni, rotini, penne. The smaller pastas like macaroni, small shells and spaghetti do not work well because they do not hold enough sauce and cheese. Other chicken recipes you will love. This post was originally published January 7, 2015 and was republished November 12, 2018 with new content. 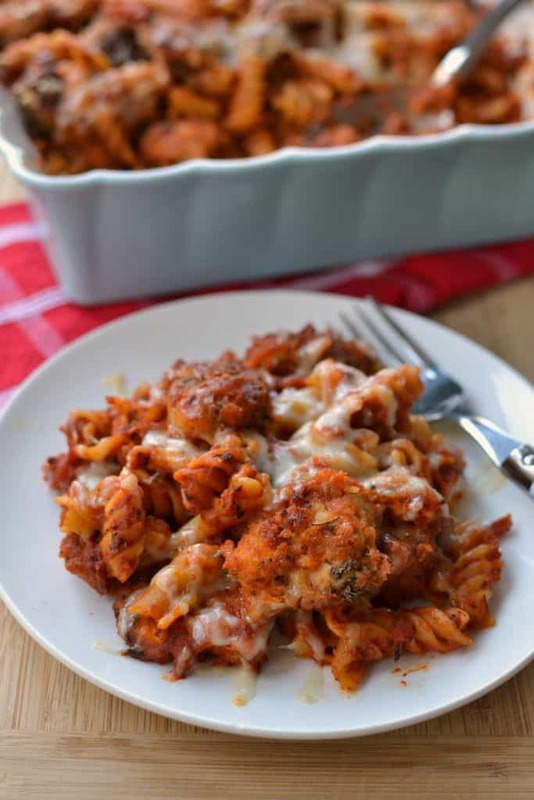 Delectable Chicken Parmesan Casserole combines crispy panko breaded chicken bites, pasta, marinara and a winning three cheese combination. Cook pasta according to package instructions and drain well. Combine both breadcrumbs, oregano, basil and garlic powder in a large plastic ziploc bag. Salt & pepper chicken pieces. Whisk eggs and milk together. Dunk chicken pieces in egg mixture. Move chicken pieces to ziploc bag and shake to coat. Heat butter and oil in large saucepan over medium heat. Brown chicken pieces on all sides and place on paper towels. 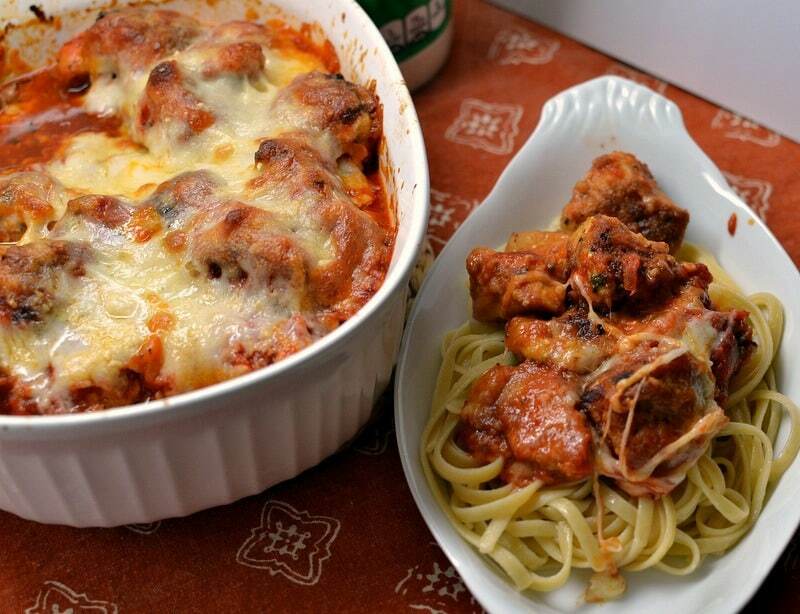 Combine your pasta, chicken and marinara in a casserole dish sprayed with nonstick cooking spray. Top your casserole evenly with the Parmesan, Mozzarella and Provel. Provel is an American cheese, produced through a combination of many different cheeses, mainly cheddar, swiss and provolone. It is readily available here in St. Louis. If is not available to you substitute with shredded provolone! Happy cooking! What size dish do you use? 13×9? I used a 1 1/2 quart Corning Ware dish wish is oblong …a little closer to an 8 X 11. I’m not familiar with provel cheese but it sounds delish! Pinning for later!